In this run-up to the election, the American Energy future seems to have faded into the quiet background. Gone are the concerns of past years, as both parties seem to have bought into the idea that the nation is well on track toward a much reduced need to import oil. Wood Mackenzie are forecasting that tight oil production will rise from 1.5 mbd this year to 4.1 mbd in 2020, with the Bakken producing 1.3 mbd, the Eagle Ford 1.3 mbd, the Permian plays (Bone Spring, Avalon, Wolfcamp and Cline) will produce 440 kbd, and the Niobrara should be good for 90 kbd. With the decline in production from the impact of Isaac in the Gulf not yet over, it is not yet clear whether the plateau in US production that was starting to form will continue, or whether the gains in production that these projections require will continue. But there are some signs that these projections are, shall we say, a little ambitious. Well costs are now running in the $9 - $11.2 million range and, to sustain production, in these formations where wells have a high annual decline rate, increasing numbers must be drilled each year to offset that decline, and the poorer quality of newer wells. But declining rig counts and other concerns are for the future, and if no one coughs too loudly we can pretend that everything remains fine until we get past November. China does not have that luxury, since the country, having set its people on an upwardly mobile quality of life path, must continue to provide the power that such a ladder requires. As I noted last time, the potential gains from the increased use of natural gas have been noted. Actions have already been taken to make sure that future supplies will meet anticipated needs and work has begun to tap the gas shales of the country. But despite those efforts the underlying strength of the Chinese power industry comes from coal. 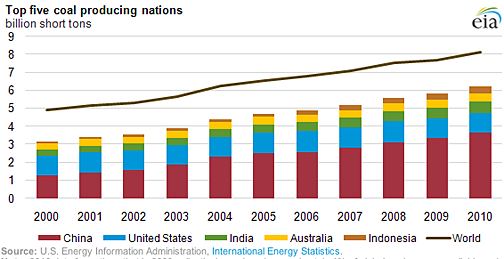 In 2007 Chinese coal production contained more energy than total Middle Eastern oil production. The rapid growth of coal demand after 2001 created supply strains and bottlenecks that raise questions about sustainability. 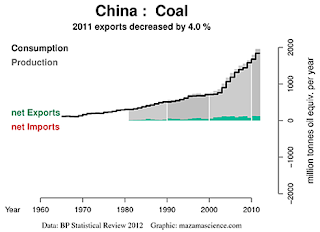 In 2010 China produced almost half of the world’s coal tonnage. 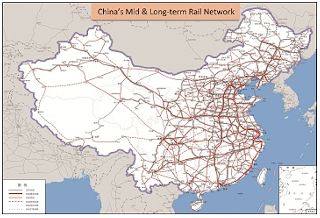 China produced some 4.52 billion tonnes in 2011 and some 45% of that was shipped from the mine to the customer by rail. As demand continues to grow those volumes will also increase. Rail takes a much longer time to install than does a pipeline, and thus Chinese recognition of this need is timely. Between now and 2015 Government plans call for an increase in transportation capacity to 3 billion tons/year almost doubling current capacity, as production of coal is anticipated to decline slightly to around 4 billion tonnes domestically, which may only exist as a target value. Nevertheless to move the coal to the power stations where it is needed, not only trunk lines, but also a large number of shorter branches will have to be created. This will be particularly true if the market shakes out and many of the smaller companies, which are apparently currently seeing some cash flow problems may fade out of business. The Chinese have always been willing to find creative ways of improving their mining technology. I remember back some 45-years ago, when the European coal industry was still strong though waning, and the Chinese arrived seeking to purchase up-to-date mining equipment. Given that coal demand and thus equipment demand was in decline, manufacturers were willing to meet the conditions of the sale. These included that engineers and technicians be at the manufacturing plant during the entire time that the equipment was being built, and that they fully how understand the process. (The argument was so that they would be able to maintain it, after arrival). Well needless to say after those initial deliveries, further orders were rare, and Chinese versions of the equipment appeared, and many of those European manufacturers are no longer around. New developments of technology in the West are much harder to come by these days. 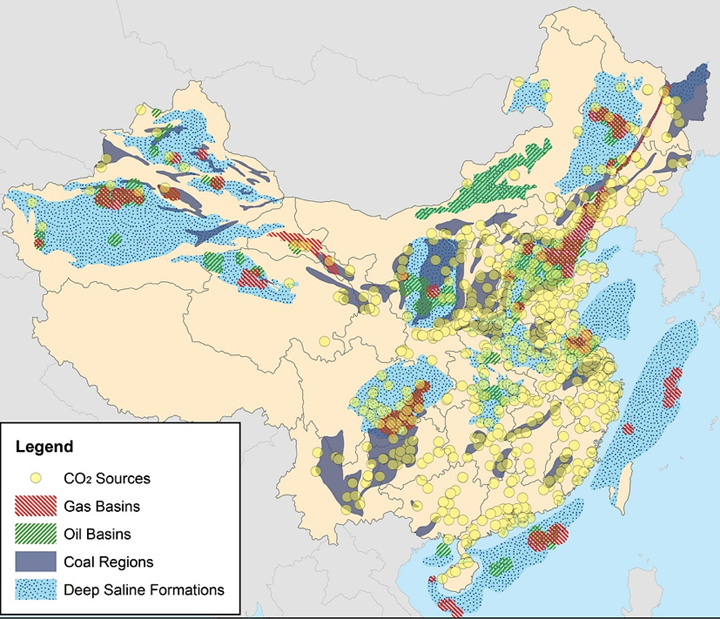 Research and innovation in coal mining in particular has fallen on hard times in both Europe and the United States (to the point of almost disappearance) and thus as China moves toward automation of its mining, particularly in thin seam conditions they are less able to draw on external sources, and must develop more of their own. Life is a little different in other ways also, and Western companies can now get into the country and collaborate on development. Peabody, for example, is now developing coal mines in China. It has also been working with the government of Mongolia and will help develop mines in the Tavan Tolgoi region. This may be the only growth region for the company at a time when the current Administration in the United States, not to mention those in Europe, seem bent on closing the industry down as fast as they practically can. Given the amount of power that will be required to sustain current qualities of life, and the disappointing, and expensive costs of recent alternatives, the question as to how long this long-term unrealistic view will prevail is a matter of conjecture. China seems to retain a more realistic view of what is going to be needed, and planning accordingly. There have been some thoughts given to the possibility of sequestration of all the carbon dioxide that will be generated from the various power plants that use this coal. However the power plants are not necessarily close to places where it might be easy to sequester the gas. The Oil Drum has been fortunate over the years to have had a number of high quality posts on the development of the coal industry in China. These include a review by Dr. Minqi Li, hosted by JoulesBurn. 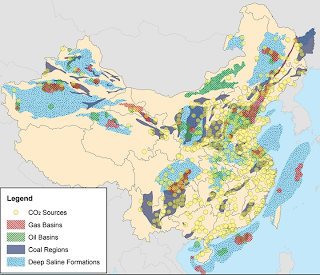 In this review of Peak Coal and China, Dr Li noted that Chinese coal production is projected to peak in 2027, at a level of 5.1 billion tonnes. He estimates a total ultimate recovery of around 257 billion tons. Euan Mearns wrote about Chinese Coal when their consumption first approached 50% of global demand, and followed that with a second piece on the role of imports. 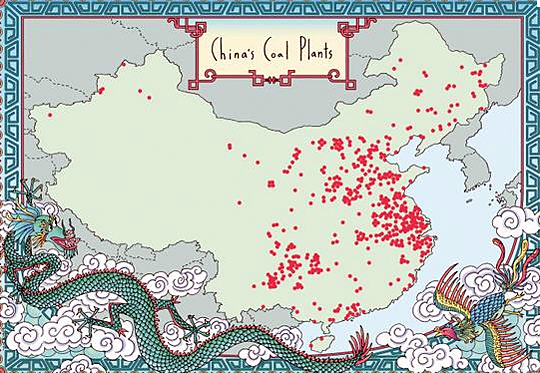 In addition Rembrandt has recently taken note of the developing Chinese coal to chemicals industry. As conventional oil becomes less available as a feed stock, so the growth of this effort will likely justify the development. 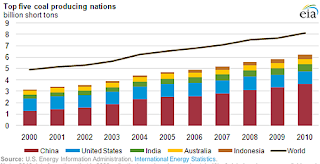 Although China has, in the short term (perhaps the next ten to fifteen years) enough coal to sustain internal growth in demand, it is nevertheless also moving pro-actively to ensure that it will have adequate supplies in the out years. Much has been made in the past of their activities in Australia, but, as I have noted, several times in the past the Chinese are becoming well established in Botswana, inter alia, in a country with almost no coal industry yet, but up to 200 billion tons of what are not even counted as reserves yet, because of lack of demand. This may be a lesson for the rest of us. I guess if you believe humans will still be around in any great numbers after the climate spirals out of control and the oceans become unproductive and massive dead zones, then burning evermore coal is OK.
Those of us who have bothered to do our own analysis of the relative warming of the last century, and possible causes, are not nearly as concerned, We find that the overly hysterical outpourings of those who, in a number of cases, serve to profit or stay employed through promulgation of that fear, are not supported by the real facts, and that the previous warming periods were at least equally warm if not warmer. Further as my analysis of state temperature data has shown, scientists have questions to answer on how the data was massaged. Questions that they have generally shied away from answering by engaging in ad hominem attacks. Consumption of fossil fuel should be minimized. Countries are now trying to reduce their export of the fossil fuel including coal and utilizing other energy sources like solar, wind energy.